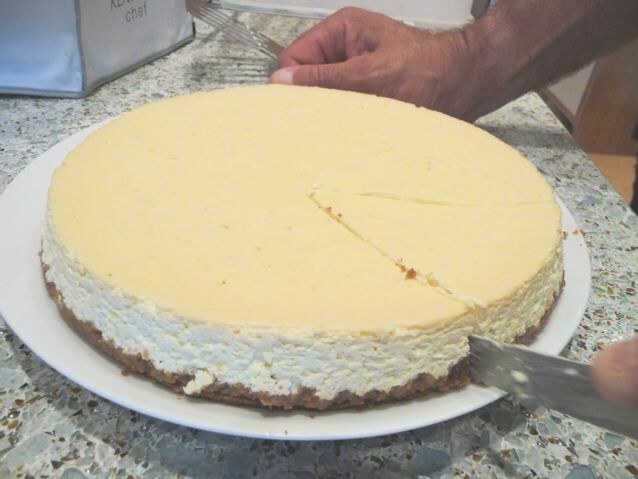 Christine @ Slowlivingessentials recently made a wonderful cheesecake. Here is her post about it. She used home made labneh and as I have been experimenting once again with making yoghurts this inspired me to make one too! So here we go: my first home made cheesecake for over ten years…..
Just one slice for me please! Whizz biscuits in food processor or place them in a plastic bag and bash them with a rolling pin to a fine crumb. Melt the butter and mix well with the biscuit crumbs. Spread the mixture evenly on the baking parchment and press it down firmly. Bake for 12 minutes in a preheated oven at 150 º C.
While the base cooks, whisk the eggs lightly, and mix them into the labneh, add the sugar, a little milk (no need to use lactose free, you could use single cream) and finally the zest and lime juice. The mixture was medium runny like a very thick pancake batter and there were a few small bit of curds floating around. I poured the batter on top of the base, put the whole thing on a baking sheet and baked for an hour on 150 º C/300 º F/Gas 2. By this point it was set but very wobbly, like a blancmange, so I left for another half an hour with the oven turned down to 100 º C.
The first cheesecake I've made for ten years! The top became a bit more yellow but stayed smooth and even. The filling started to pull away from the edges a little and it was more solid looking by then. I then let it cool, put it in the fridge and we didn’t eat it till the next day. I also froze some of it, putting grease proof paper between the slices as it makes enough for at least 8 – 10 slices. Topped with passion fruit coulis and some English blueberries. This was a very zingy cheesecake, quite dense, I am sure that you can get different results depending on how your labneh comes out and what else you add. As Christine discovered it sets beautifully. If you have a sweeter tooth you might want to add more sugar and reduce the lime juice or even just use the zest and leave out the juice altogether. 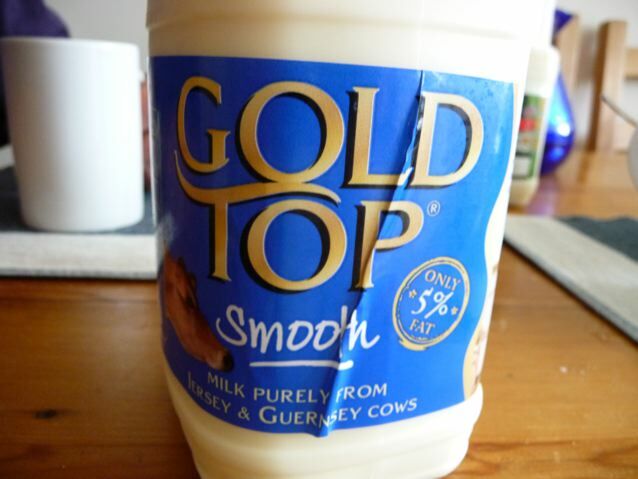 I bought creamy golden milk called Gold Top, made with rich Guernsey and Jersey milk. The bottle said it had 5 % fat, so by my sums if a litre of that makes 500 grams of labneh, then the filling would be about 10 % dairy fat plus the eggs, so not a slimming dessert but not maybe as full on as a cheesecake made with loads of cream. I couldn't drink it, but it makes great yoghurt! Make sure that everything you use to make yoghurt is squeaky clean and ideally pour boiling water over all your utensils. If you are using regular pasteurised milk you need to scald it to 85-90 º C and keep it at that temperature for about 10 minutes. Cool the milk to 50 º C (122F). For a thicker yoghurt whisk in 2 large spoonfuls of milk powder to each litre of milk. You can experiment with how much milk powder to add. Alternatively use UHT milk which you can use straight from the carton. 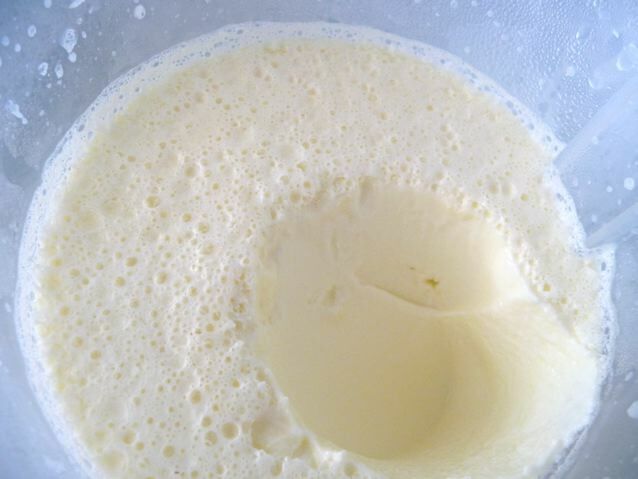 Once cool mix with your starter yoghurt and incubate using whatever method you prefer. I use a little heated yoghurt maker, but you can also use a thermos flask or the easi yo system. You can leave it in a warm room too as yoghurt will culture that way as well, I am sure that in many countries where yoghurt is traditionally made it is not put in a yoghurt maker but just left to do its thing! I have done the leaving it in a warm room method and I find the yoghurt can take a very long time to gell that way and I get a more consistent yoghurt if I use the heated yoghurt maker, but there are many ways to do this and I don’t think my way is particularly better than anyone else’s. Once made, yoghurt is preserved by its acidity, so keeps well in the fridge for a week or more. To make labneh, strain the yoghurt over a bowl for a few hours. * I use muslin cheesecloth in a sieve and then I pop a clean showercap over the top of the whole thing to stop anything falling into it. You will then end up with a quantity of delicious whey you can use to bake bread with, example of a lovely loaf you can try here – or freeze till you want to use it – and fabulous solid curds that you can use in the recipe above or as a substitute for cream cheese in many other dishes. * Choclette says below that yoghurt needs to be strained for 12 – 24 hours to get labneh. My experience is that it depends on the state of the yoghurt when you start off. This very rich and thick yoghurt drained very quickly and was ready to use in about 4 hours, but a thinner yoghurt would probably be best left for longer, overnight in a cool room at least. 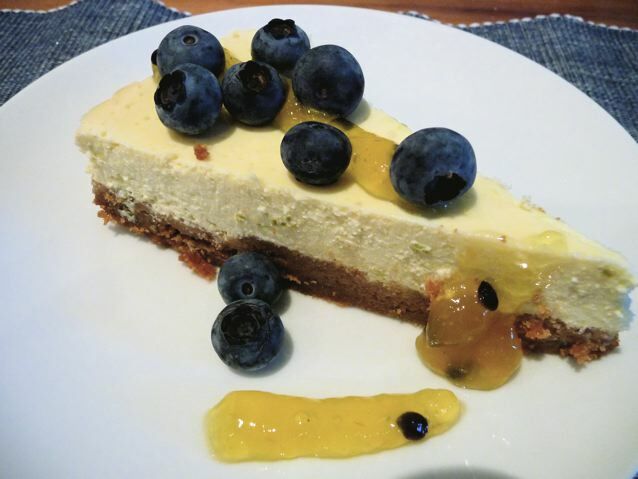 This entry was posted in Cakes, Recipes, Yoghurt and tagged labneh, labneh cake, lime cheesecake, strained yoghurt, yoghurt, yoghurt cheese cake on 26/07/2010 by Joanna. This looks so good Joanna – wonderful flavours. I don’t know, you don’t make a chesecake for 10 years and then you go and make a super fabulous one just like that! As I understand it with labneh, it’s best left for at least 12 hours to strain, but up to 24 hours if you want something a bit more solid. Joanna, I am not a sour cream or cheesecake lover – at all. But that first photo looks mighty tempting to me! Nice job. That’s OK Steve, dairy is funny stuff. I can’t stand drinking straight milk which I believe is something that adults do quite a lot in the States. It’s very rare here to see adults drink milk by the glassful. You should certainly try and wing it more often, Jo. That looks superb! Looming – he had to wait 24 hours… he was the one slicing it up ! Joanna that looks great. Now that you and Christine have both made it I think it will have to go on my list. The list that keeps extending. I think I would do a little looming as well knowing that was in the fridge. I know that extending list, Brydie – I find I make the breads, but take a lot longer to get round to the cakes… unless I have something that needs a home, as in this case a huge pot of very rich yoghurt! A cheesecake sounds perfect for my next sweet project. We are just finishing up the rhubarb custard pies I made over the weekend. Thanks for the idea and the more than lovely pictures. Oh, Joanna, I wish I had a piece of that right now ~ yum! I have yet to try making a cheesecake . . . must get to it soon. And love the clever idea of freezing individual pieces! Oh, my! Your cake looks amazing, Joanna! I notice we used different quantities of ingredients in the cheese part…and both set without any problems. I think my base went wrong by not baking it first..my recipe said to refrigerate it until baking..and it turned out a crumbly mess. Yours looks much nicer. Is your oven fan-forced? Re. the banoffee pie…I remember trying one some time ago…rich toffee with LOTs of whipped cream on top and sliced bananas…but like you said, just one slice for me too, please. Christine – I wouldn’t have tried without your inspiration to start with… :) and it is interesting that they both worked, there is obviously quite a lot of flexibility in baking this sort of thing, which is good as it means one can reduce sugar and eggs and so on according to taste without having too much of a disastrous effect .. My oven is electric, and has a choice of being fan or top bottom heat and various other exotic programmes that I rarely use. I baked this on the top/bottom setting. Abby, I figure it’s worth trying freezing most things. The bialys froze really well, and in fact I think they came out nicer after freezing, 10 minutes in a hot oven straight from the freezer and they were lovely! I thought you were away on holiday somewhere? Heidiannie, I like the sound of your pies, Brian is a big rhubarb and custard fan!